While baking Hamelman's Five-Grain Levain for the Community Bake, I mis-read the water weight from the wrong column and added 284g of water too much. This brought the total hydration, including the soaker, to 128.6%. My gross error spawned a YouTube video that has taught me things and hopefully others will also benefit. The 8 minute video may be viewed HERE. 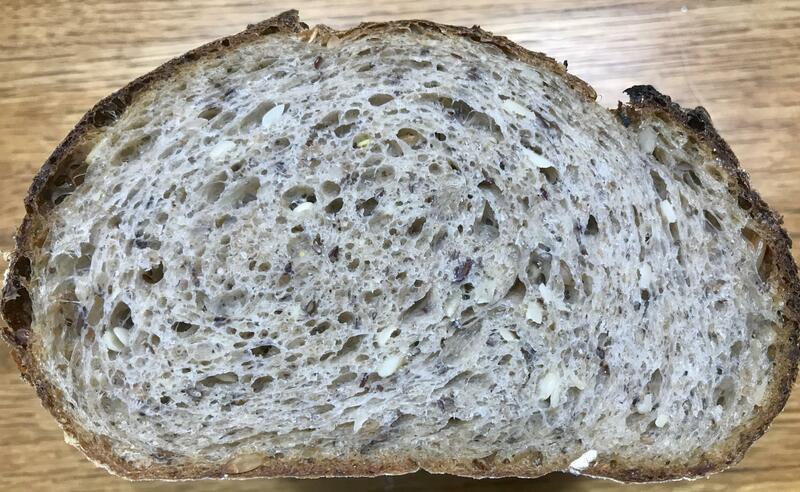 For those interested in the Five-Grain Levain bread, this lengthy post contains loads of information. With a wonderful crumb. You'll recall my: "if it works, you learn something, if it doesn't work you learn something". And here we are! One thing that wasn't accommodated for in all of the flour addition is that the percent of preferment flour dropped. Apparently it wasn't enough to alter your timings very much, I'd guess. I have my formulas printed out and I keep a bench knife positioned just under the ingredient that I'm scaling out at that moment. The corner of the blade sits right under it so that I can't pick up an amount from another column or line. The Percentage of flour prefermented dropped from 25 to 20.5%. I made a mental note to try the bench knife idea next time. I only hope I can remember to do so. loaf of bread to me. If it ain't broke don't fix it:-) I wouldn't change a thing! Is it possible to over oxidate the dough by using too many slap and folds? Update - I addressed this question in a separate post. See it HERE. Im not strong enough to go through all that slapping, I'd add chia to soak up some of that moisture or oat flakes or both. I know you want to keep it simple by increasing just the flour, but at the same time you did reduce the amount of soaker grains. Well, watching your 8 minute video is all the exercise I need today and I'll take a rest now. Congratulations on your persistence and determination to make it work. You have created a beautiful loaf of bread with great crust and crumb. I can almost taste it. Alan, I really enjoy slap & folds. The feel of the dough, the audible sounds and rhythms, and even the workout is pleasing to me. I often do more reps than intended. It’s that much fun. The “miracles” that take place in an instant never ceases to amaze me. The very act of making sourdough bread is natural, and a bit artistc. It transports me back to a time when things were simpler. I am old school and proud of it. Thanks for the funny comment and also the complimemt. Yes, Abe. I added an extra 4g salt to compensate for the additional 200g flour. Because of the additional flour the addins were decreased by roughly 2%, but it worked out OK.
very nice loaf indeed, Danny. this was a great video to watch! Very informative.